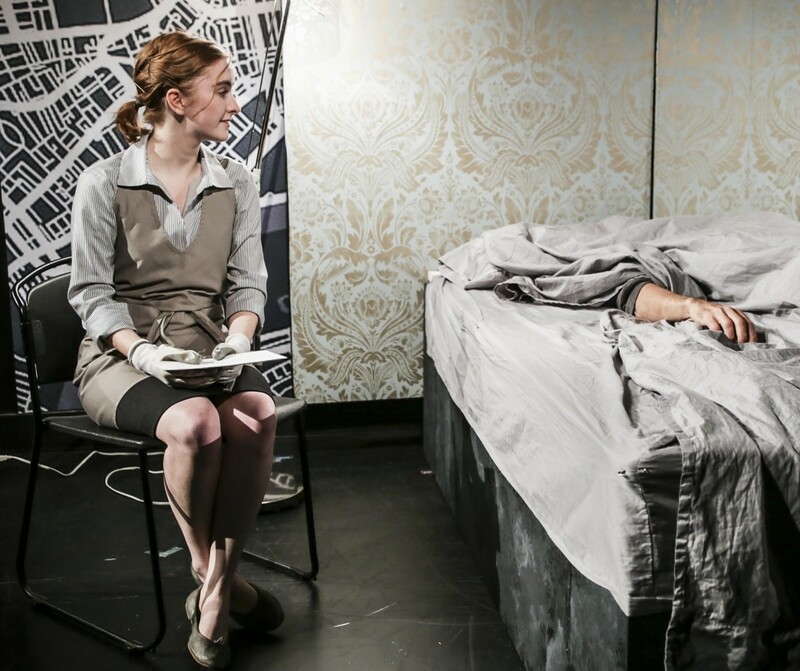 Erin Humphrey as Amy (left) looks for reason with the dearly departed in Coal Mine Theatre’s suspenseful and absorbing staging of Breathing Corpses on stage until November 13. If it’s true we start to die the moment we are born then it doesn’t make very much sense donning smiles galore in endless selfies as fend off the inevitable, does it? Yet it could be said that the happiness deprived we encounter every day in our journies really are just cadavers on borrowed time. Playwright Laura Wade weighs in on matters with a clever dramatization of a three storylines to illustrate this point. In Coal Mine Theatre’s presentation of Breathing Corpses, there truly is no colloquial 4th wall, in the company’s intimate environment, you’re literally imbedded in the piece like a fly on a prop listening for vital signs. All starts off light and fluffy when a chambermaid Amy (Erin Humphrey) finds herself in all too familiar situation when she discovers a lifeless body in a hotel room. A farewell letter puts the act into perspective but there’s no doubt going to be more questions from hotel management about this angel-of-death’s ongoing misfortune. Flashback to a not so typical day in a storage facility where there’s little sense of urgency to investigate a foul smell coming from one of the units. Simon Bracken’s Ray is also well aware that history tends to repeat yet has a difficult time convincing his boss, Jim (Richard Sheridan Willis), that emergency measures should be taken to disprove his theory. Severn Thompson’s Elaine will respond to the trauma in due time after her sunny outlook begins to set on this dark day. Flashforward to a restless Sunday when the dog days of summer turn into the dog days of violence. Kate (Kim Nelson) is sleepless after her weekend is turned upside down when stroll in the park with the K9 from results in a murder investigation when a female body turns up in the bushes. Try as he may to restore the calm, Ben (Benjamin Sutherland) just can’t get not satisfaction from this painful distraction. Director David Ferry prevents the production from flatlining by thoroughly checking for a theatrical pulse in each of the play’s five interconnected scenes. While he’s got his work cut out for him in such a small Danforth venue but his achievement makes it hard to imagine this story feeling the same in any other environment. We all react to death differently especially when it involves our own. Breathing Corpses reminds us that life goes on long after the thrill of living is gone.